It’s the holiday season, and while some debate whether turkey or ham is the ideal dinner, there’s one entree that sticks in my mind this season: pizza. OK, so pizza is basically a year-round food for us. But come holiday season in particular, pizza has special meaning. It’s a meal I cook with my niece and nephew (and now my own kids) before Thanksgiving takes over the kitchen at my sister’s house, and it’s a dish I make every time my in-laws come at Christmastime. What I love about pizza is that it’s democratic – everyone has a vote and every vote counts. I’ve been known to make a single pizza with 4 different toppings – one in each quadrant to suit people’s preferences. One child will only eat cheese, whereas another likes pepperoni. I like goat cheese which my husband can’t stand, so he gets regular pizza cheese on his. One pizza, four ways – everyone wins! I also love pizza because it’s a great way to serve up vegetables. When I was living on my own after college, I ate plenty of fruits but couldn’t think of a tasty, easy and cost-effective way to make sure I ate enough vegetables. 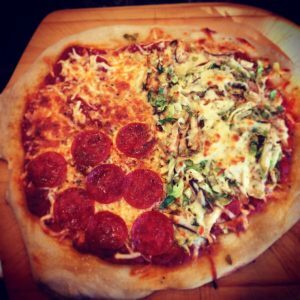 So I turned to pizza – I took a dough, added sauce then piled on whatever veggies I felt like, such as bell peppers, mushrooms and broccoli. Add some cheese, cook it up and enjoy. Leftovers were delicious for brown-bag lunches (also economical) or another day’s dinner. While a stone is not required, it’s certainly less expensive than purchasing a pizza oven – and gives you many of the same results. Pizza stones give you a crispy crust without overcooking the cheese and toppings. Keep the stone in the oven as it preheats, at least for 60 minutes before putting your pizza on it. I actually keep my stones (I have two) in my oven all the time. And never wash your pizza stone with soap! Just scrape it with a pan scraper once it’s cooled. Sure you can make your own, but chances are you can also find balls of raw dough in the deli section of your local grocery store. Trader Joe’s has some good ones (though I must say, the whole wheat dough is too dense for me and my family). Or, if you have a favorite neighborhood pizza place, ask if you can buy a ball of fresh dough directly from them. Cold dough is very elastic and will contract when you try to roll it out, meaning you’ll have to keep fighting the dough to stretch it out. Too much sauce can make the dough soggy and drippy. Leave about a ¾-inch space from the edge to make a pizza parlor-style crust. And, pay more attention to the edges than the center. As the pizza cooks, the toppings will gravitate toward the center. The center also takes the longest to cook. Lightly brush olive oil on the crust before baking. It gives the crust a really tasty crispness. Here are some of my favorite pizza toppings, using a plain dough and tomato sauce base, and topped with pizza cheese (shredded blend of 4 or 5 cheeses, or just use mozzarella). But feel free to experiment with your own ideas – that’s half the fun! What are some of your favorites? Please share in the comments!